Working with one of the nation's leading monitoring firms, once an alarm is activated, MSS uniformed agents are promptly radio-dispatched to the site. 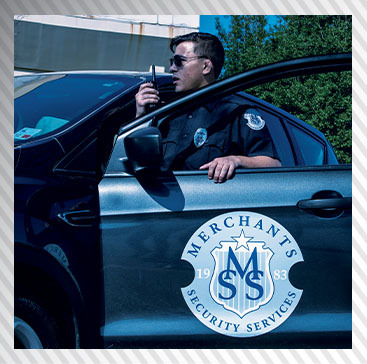 Upon arriving, Merchants Security Services agents then verify the status of the residence or place of business. In the case that it is not a false alarm and a threat has been identified, law enforcement is dispatched immediately to the premises. Because local law enforcement places alarm activations at the bottom of their response list, in many major metropolitan cities it can take hours for the police to respond. MSS can significantly reduce response time and ensure that your premises are protected.